Last night - while you were sleeping - the Rift Recon Store went live. After processing our first orders this morning, we’re excited to announce that the launch is now official: the Rift Recon Store offers the highest quality physical security and penetration testing products and kits, and trainings, available anywhere. The Rift Recon Store will be adding new products every week. 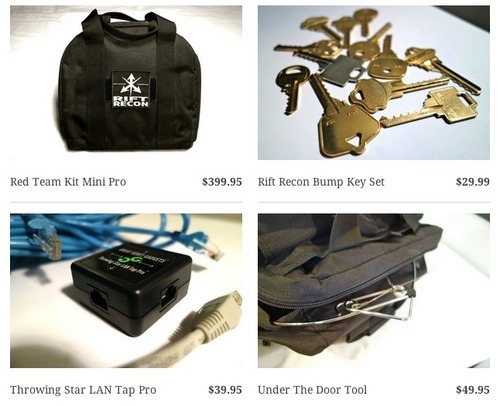 Get individual tools you can’t find anywhere else (like the Under The Door Tool), Rift Recon kits (including the original Red Team Kit) and exclusive, expertly selected collections (such as Rift’s own Bump Key Set) - plus educational documentation, trainings, and more. We’re thrilled to have made some great partnerships with brilliant toolmakers, trainers and engineers - and this makes us uniquely able to offer you top-shelf gear at affordable prices. We know your work is serious, and so are we. This isn’t playtime, and you no longer have to settle for lower quality knockoffs, frustrating checkout experiences, or unresponsive merchants. Don’t miss our sibling retail shop at Exploit Hub, whose unique Hardware suite is curated and verified by Rift Recon. Exploit Hub Hardware is also growing rapidly, and it’s where you’ll find items like the sweet Nuand bladeRF, the Pwnie Express Pwn Plug Elite, plus Rift gear - and is the only place you can buy it all with Bitcoin. So, click by our new shop and see why our first customer called it “like an iTunes app store for physical security.” We’re so proud of our team! Keep up with our ongoing product releases, training announcements, and more with the Rift Recon Weekly Newsletter.